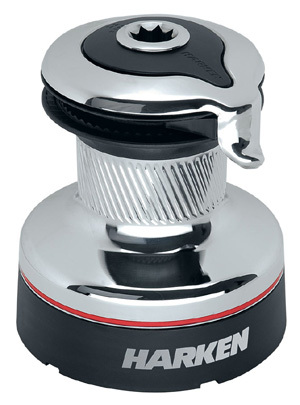 Introducing the all-new Harken Radial Self-Tailing winch line! The strong, one-piece stripper arm completely covers the winch top. The top does not rotate, preventing fingers and clothing from catching in moving parts—an important safety feature, particularly when operating powered winches. The arm can be adjusted to multiple positions after the winch is mounted and is shaped to smoothly feed line into and out of the self-tailing jaws. 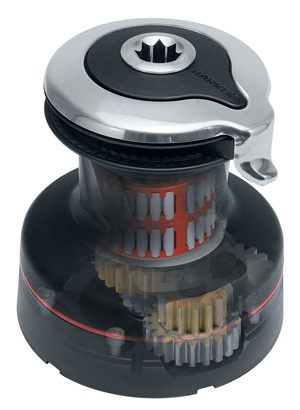 Under line pressure, the spring-loaded upper jaw adjusts to accept a variety of line sizes. Winch sizes are now determined by maximum working load (MWL) instead of power ratio. Maximum working load measures the performance of the winch, as opposed to the power ratio, which is the only a geometrical parameterof the winch. Every Radial winch is dynamically tested for 2,000 cycles pulling the MWL to evaluate wear on the mechanical parts.